In recent years, Android phones are used dramatically. Still, one problem remains for many of us: all of our music is on Apple's iTunes so and there’s no easy way to transfer our music, podcasts, playlists, and other audio to our Android devices. iTunes is a pretty excellent software tool to manage music. 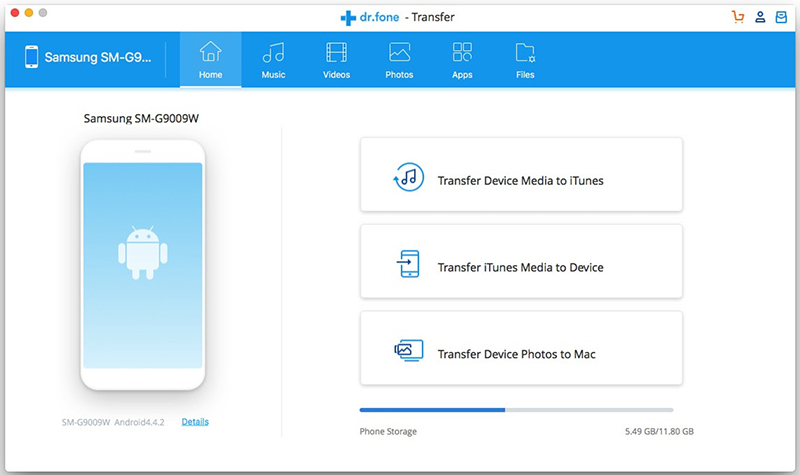 However, the transfer feature is only developed for Apple devices users. 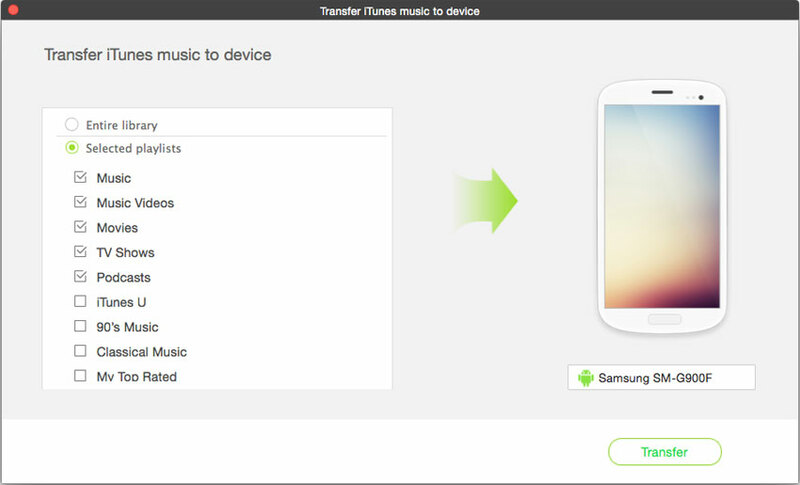 Android device users can’t use it to transfer music from iTunes Library to any Android device. And it has become the headache for people who switch iPhone to Android Phone. Never mind, now with iMusic, you can get iTunes music to Android easily. Except Using iMusic, we also will provide other 4 solutions to transfer music from iTunes to Android. iMusic is a handy piece of software designed to cover a wide selection of needs that first-party suites like iTunes fail to cover. 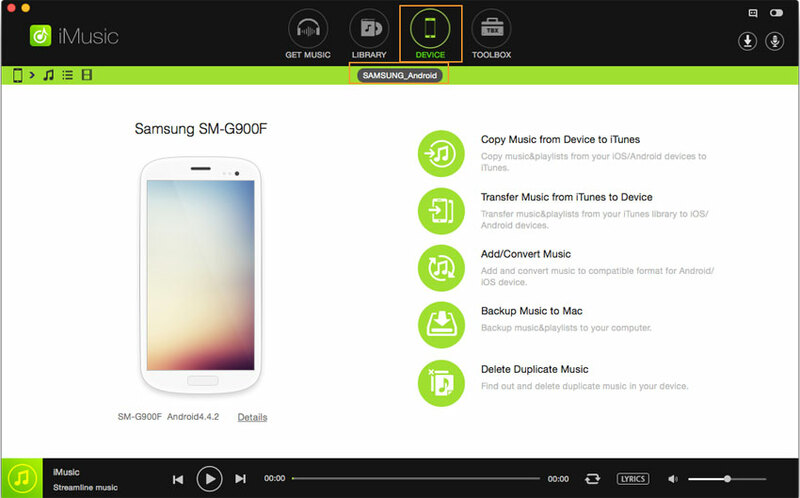 It allows you to import or export music from your computer straight over to your phone/iphone/ipod/ipad/mac/windows and heading back across too—so if you get yourself a new Android phone, you can take all of the music off your iTunes Library to Android phone instantly. Here are some of its main features. It works with a broad range of Android devices running from Android 2.1 to Android 6.0. 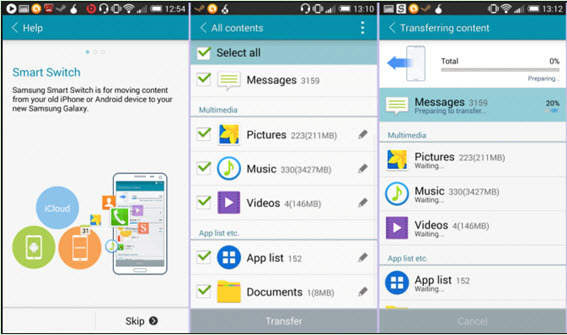 Besides, music on iPhone, iPod and iPad, even computer can be transferred to Android devices (available for Windows version). Step 1. Firstly, open iMusic. Simple, effective, loads the software you need to get the job done. After then, connect your device with your computer via a USB cable. When connected successfully, you can see the device displayed in the “DEVICE” window of iMusic. If not, please enable the USB debugging on your Android phone first. Step 2.In the “Device” window of iMusic, there is an option “Transfer Music from iTunes to DEVICE”. Click it and select the file type in the next window to transfer: music, music videos, TV shows, Podcasts, etc. After selecting the file type, click “Transfer”. Note: if you have thousands of songs or music videos in your iTunes Library, I suggest you select the needed songs to transfer. Otherwise, your phone will be occupied by songs and the storage might not enough to save the songs as well. In the next step, you can see how to do it. Step 3. (RECOMMENDED WAY) Click “LIBRARY” on the top of iMusic. In the window, all the songs in iTunes Library are displayed. 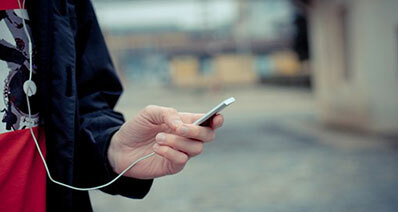 From there, you can try 2 options to transfer music from iTunes to Android phone selectively. Option 1. 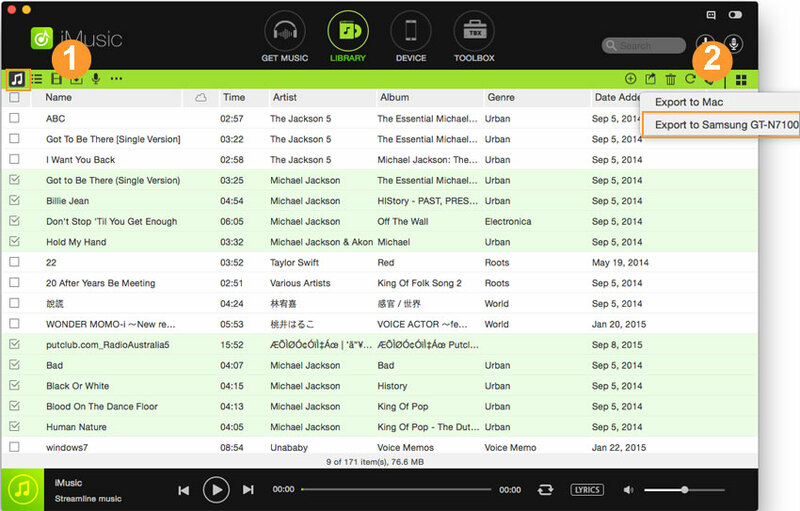 Check the songs you need and click the Export icon on the top right of the window. Next, select “Export to (your Android device name)”. Option 2. 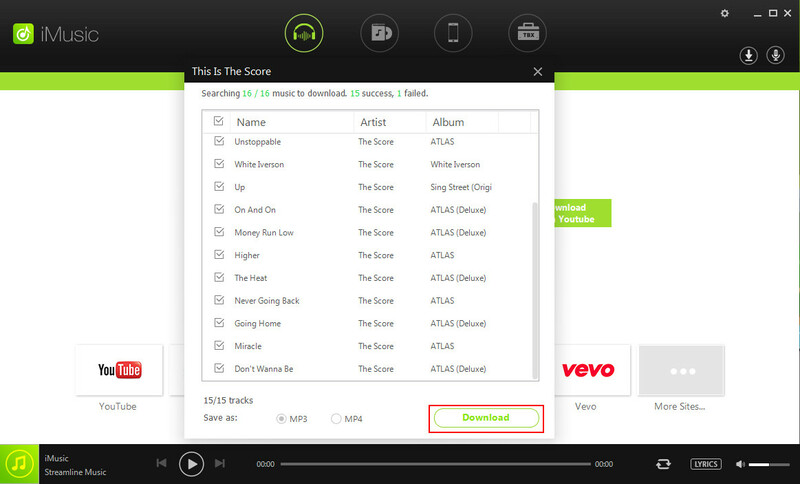 Check the songs you need and right-click on the window > select “Add to” > “Add to (your Android device name)”. iMusic is the best software to transfer music from iTunes Library to Android devices. 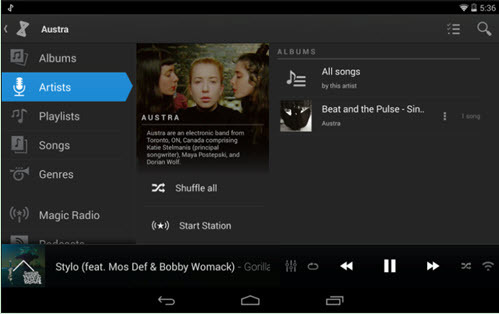 Besides, you can also transfer music from Android phones to iTunes Library as well. There are still some other software tools you can use to augment the process of manipulating your music from iTunes to your Android phone. Here are the 5 you might be interested in. Step1: Come to find the location of your iTunes media folder on your PC. Step2:Connect your Android phone as an external hard drive via USB cable. Step3:Open the iTunes media folder then copy and paste iTunes music to your Android device music folder. When put iTunes music to android phone, Apple Music is another good choice . Before start it, you need to make sure that you've signed in to Apple Music with the same Apple ID. Step1: Go to Google Play to download and Apple Music app to your Android phone. Step2: Get started by Tapping the trial offer. Step3: Next select the type of subscription per your needs. Step4: Input your Apple ID and password. Note: When the trial offer finishes, you need to subscribe to the Apple Music service, which is $9.99/per month individual or $14.99/per month family plan. 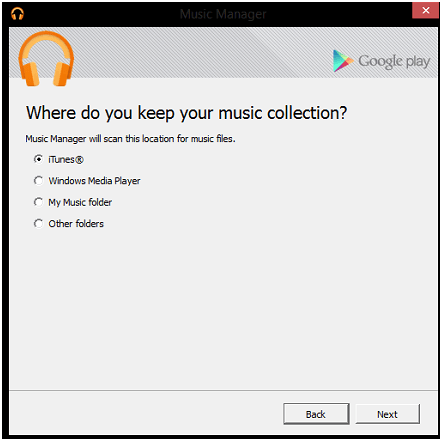 As is known to all, Google Play Music have the cloud storage for up to 50,000 songs, and it is very useful to be a iTunes to Android transfer Tool. 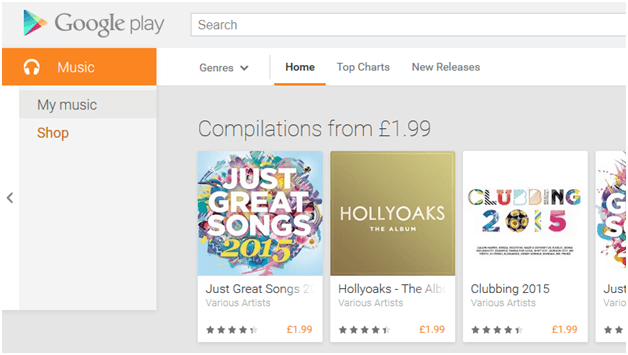 Step1: Go to the Google play store web page and then head for "My Music" tab to begin. 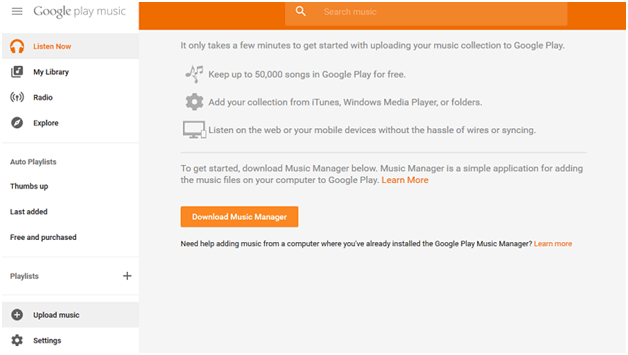 Step2: Next download Music Manager by clicking the “Listen Now” tab . Step3: Select upload songs to Google Play and click "Next". Step4: Select the "iTunes" to ensure that the library is scanned. 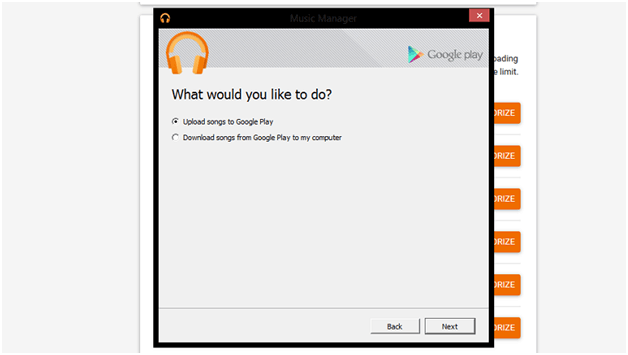 When the Android device is done then re-synced the android device with the Google Play music to transfer the content. 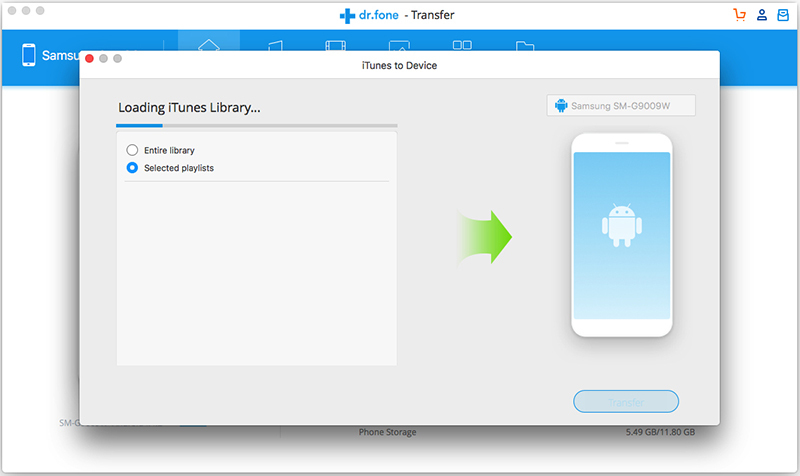 Step 1 : Launch dr.fone - Transfer (Android) and then connect your Android to your Mac or Windows PC. Step2: Click "Transfer iTunes Media to Device". Step3: You can select the entire libray, or select the files which you want to transfer from iTunes to Android. Then hit "Transfer" button. The DoubleTwist app is a music player and podcast manager that has over 100 000 five star ratings on Google Play. It could transfer itunes library to android. And it’s been recommended by the Wall street Journal, The New York Times and the BBC. 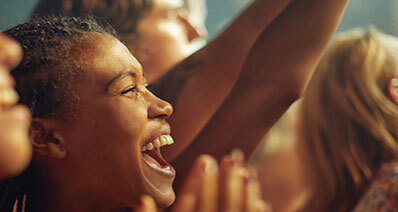 It’s free to download with an optional in-app upgrade to a paid, premium service. 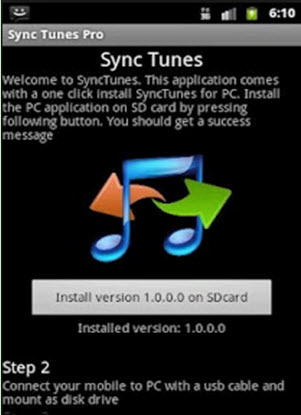 Synctunes is a program that you can use to sync your music, videos and podcasts between you iTunes and wireless android devices. 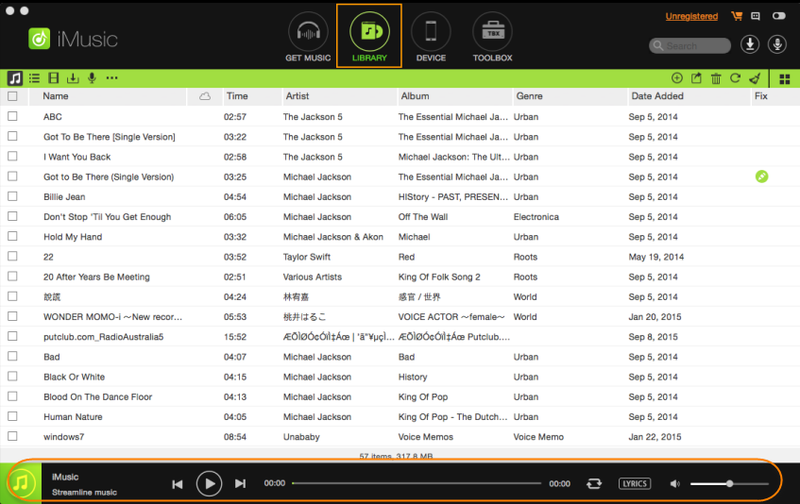 It also could transfer itunes library to android.It’s been made available for Windows, Android and Mac. Synctunes is priced at $2.50 and has a Google Play rating of 4.1 for 3,28 reviews. 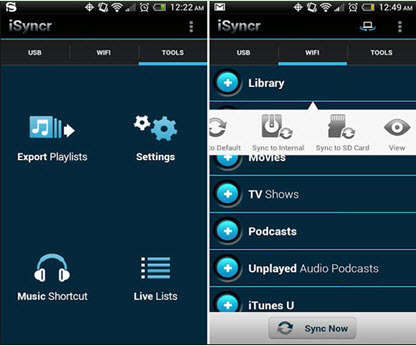 This app is free to install and allows you to sync your iTunes library with your android over WiFi and/or USB. 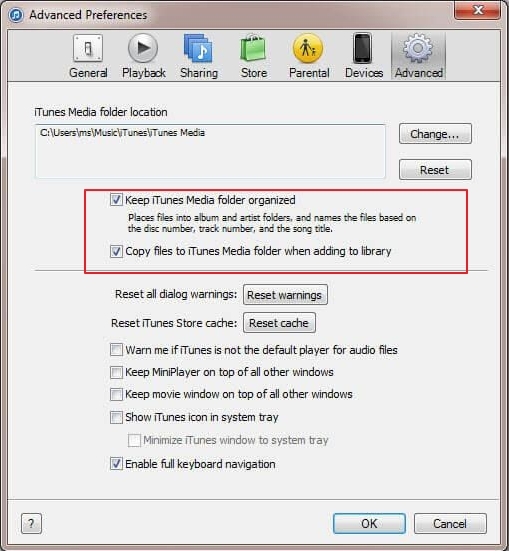 It’s also possible for you to use this program to sync with multiple iTunes libraries. It’s also available to use when syncing with an internal or external storage, including lollipop SD cards. 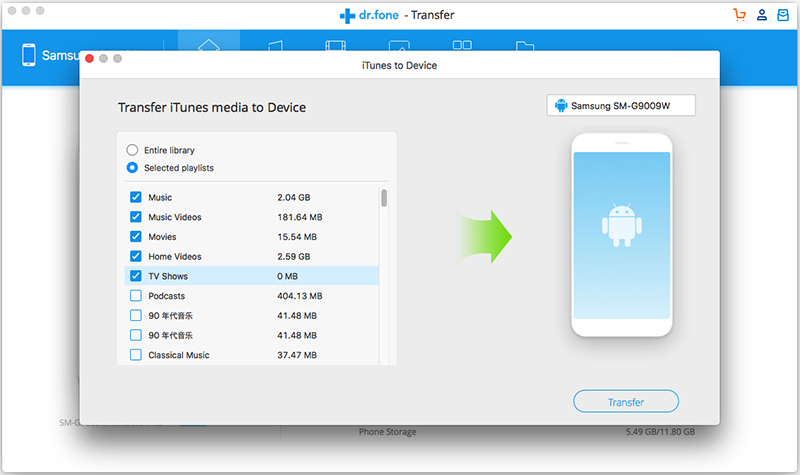 Smart Switch is a good bet for anyone who wants to transfer their music files from iTunes to their Samsung phone. It’s free to download and has a 4.3 rating from 94,569 reviews on Google Play Store. This program will also let you transfer various other types of files including messages, photos, contacts, calendars etc. SHAREit is believed to be the fastest program in the world for sharing files across multiple platforms. transferring itunes library to android and sharing is avaiiable. 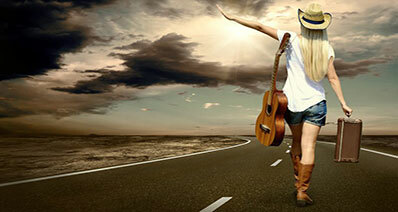 It’s supported by Android, iOS, Windows and Mac. It has a user rating of 4.5 from 1,645,412 reviews on Google Play Store and is the number one most downloaded app on Google Play in fifteen different countries.